At the start of his painting career, Peter Wagon painted picturesque Post Offices around the Country for the Post Office as part of a campaign to promote the Savings Bank. He also designed the Post Office Coronation Poster in 1953, which was displayed throughout the UK. 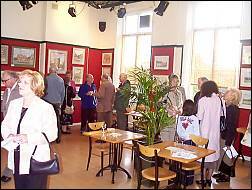 His first exhibition was at Bury St. Edmunds, 40 years ago. 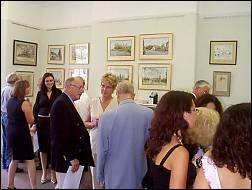 Since then, there have been exhibitions at Harrods, Cardiff University, London, Crewe, The Federation of British Artists as well as New York, Germany and many other locations. 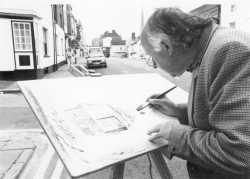 In the course of his career he has painted all over the UK. Peter was particularly proud of the commission to paint seven Stately Homes for their owners; Woburn, Blenheim, Beaulieu, Harewood House, Longleat, Castle Howard and Warwick Castle. The collection, named the 'Magnificent Seven' was exhibited in turn at each of the houses mentioned, and at the end of the tour, returned to the owners’ collections. 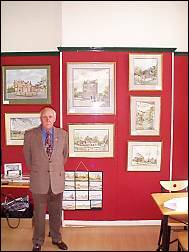 Later Watercolours include Floors Castle, Windsor, Chatsworth, Chenies, Hatfield House and many others. He particularly enjoys his long association with Woburn Abbey, especially the series of paintings featuring interiors at Woburn, some of which can be seen in publications about the Abbey. 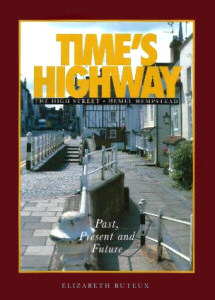 Peter lived in Hemel Hempstead for over 50 years and was associated with many of the town's assocaitions and trusts; The Heritage Trust, The Arts Trust, Friends of St Mary's fund - raising for the Spire - and the Hemel Old Town High Street Association. 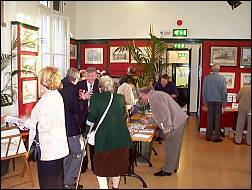 His drawings and watercolours featured hundreds of subjects around the Dacorum area. Peter was diagnosed with Alzheimer's disease in the early 2000s and sadly he passed away peacefully on Sunday 26th August 2012 at High View Lodge aged 86 years. It had been several years since he had painted seriously although he did do the odd sketch, the last serious quality paintings date from around 2008/2009. Loving husband to Doris, father to Vicki, Sally and Peter; grandfather to Rosamund, Pearl and Paddy. He is sadly missed by his family and friends. A Thanks Giving Service was held on Wednesday the 12th September at 2.30pm at St. Mary’s Church, High St., Hemel Hempstead.